The MOSSAR Color Guard is shown here presenting a Junior Reserve Officer Training Corps Award to Air Force JROTC Cadet Alex Asmus, at Lee's Summit North High School, on Wednesday, April 27, 2011. The MOSSAR Color Guard along with MOSSAR Color Guard Commander Robert Grover, presented Air Force Cadet Alex Asmus with the J.R.O.T.C. Award. 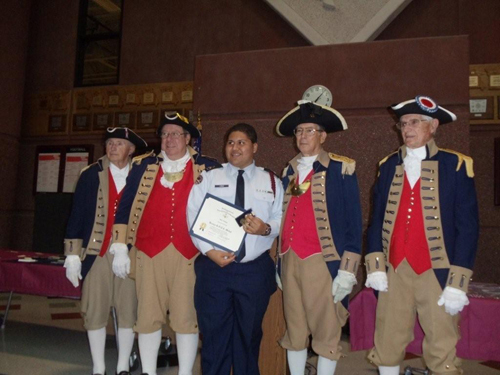 Photo (L-R): Captain Al Paris, Captain James L. Scott, Air Force JROTC Cadet Alex Asmus, Major General Robert L. Grover, MOSSAR Color Guard Commander, and Compatriot Walter Glenn.